Of all the designers inspired by Colin Archer's seaworthy double-enders, William Atkin seemed to get it just right. And of all the boats he designed in that tradition, his Ingrid seems to inspire blue-water sailors and wannabes the most. Of the design he said: "She has all the characteristics usually associated with seagoing ability. She is the kind of boat that behaves in rough water. She can be depended upon to sail herself. She is ableness personified. And equal to any situation." Since the design appeared, boatbuilders have made Ingrids of wood, fiberglass and even ferro cement. Spiritus is as beautiful an example as you are going to find. She's made of fiberglass, most likely by one of the several boatyards who produced Ingrid hulls. Many of these builders would sell to any stage of completion. 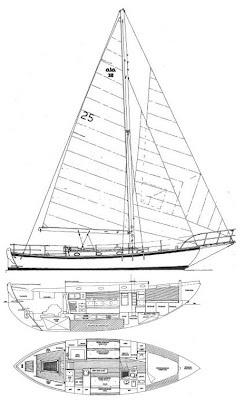 For every well-found yacht like Spiritus, there is probably at least one unfinished boat in a field or boatyard whose owner ran out of money, time or enthusiasm. In one boatyard I visited, there were three Ingrid hulls lined up - two of fiberglass and one of ferro cement - the boats were decades old, yet never finished. A sad fate for a lady made for the sea. 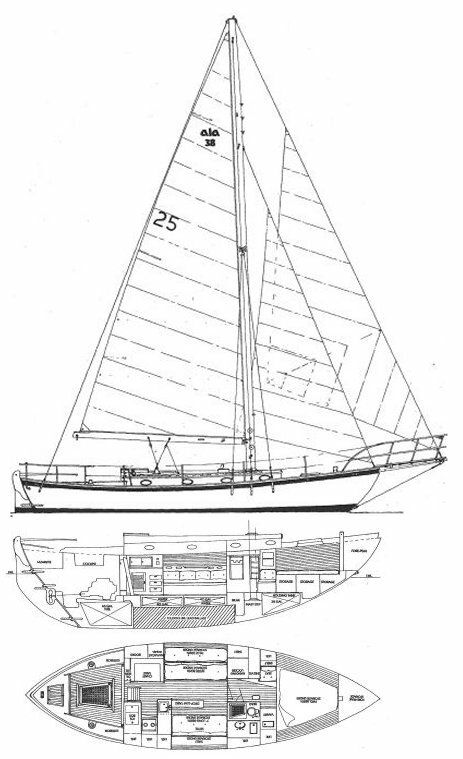 Originally designed as a ketch, later Ingrids also had a cutter rig, like this Alajuela 38. That's my kind of boat ! Mine too Max! There are a lot of them here on the West Coast of the US. At least three boatbuilders in Washington State and California cranked out a bunch of hulls in the '70s and '80s. I own her. She is a beauty and a pleasure to sail. Getting ready to take her to sea for real. Mexico then Australia if things go well. She is currently in La Paz, Mexico after sailing south along the West Coast to San Diego and joining 150 or so other boats headed to Mexico in the Baja Ha-Ha 2012 rally. If you are interested in her travels and more pics see the blog I started for her on Christmas Day 2012. Glad to hear things are going well. We noticed your boat name in reports of last year's Baja Haha, so we knew you got that far at least. Hope the cruise is going well and the boat is everything you hoped for. I'll watch for updates from you here. We are planning on cutting the dock lines in July of 2014 and doing the Haha that year.